Poltava region [Полтавщина; Poltavshchyna]. A historical-geographic region in Left-Bank Ukraine. The region is bounded to the southwest by the Dnieper River, to the northeast by the Central Upland and Slobidska Ukraine, to the south by the Dnipropetrovsk region (in Steppe Ukraine), and to the north by the Chernihiv region (coinciding with the edge of the forest-steppe and forest zones). Until the 1770s it was part of the Hetman state, and in the 19th and early 20th centuries it corresponded roughly with the territory of Poltava gubernia. It included 45,900 sq km (with 3 million inhabitants) of Poltava gubernia, and currently includes 29,000 sq km (1.7 million inhabitants) of Poltava oblast as well as parts of Cherkasy oblast, Chernihiv oblast, Kharkiv oblast, Kyiv oblast, and Sumy oblast. Physical geography. 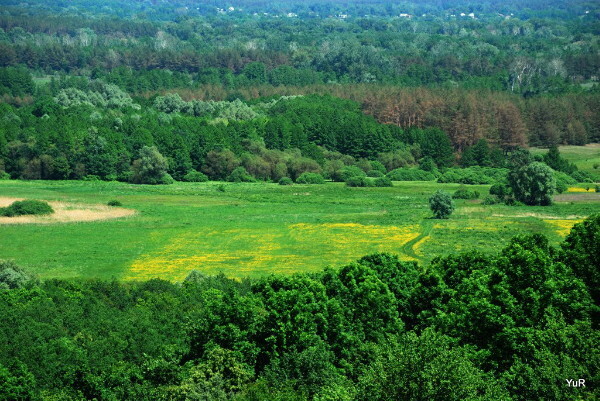 The Poltava region lies in the southern section of the forest-steppe reaches of the Dnieper Lowland. 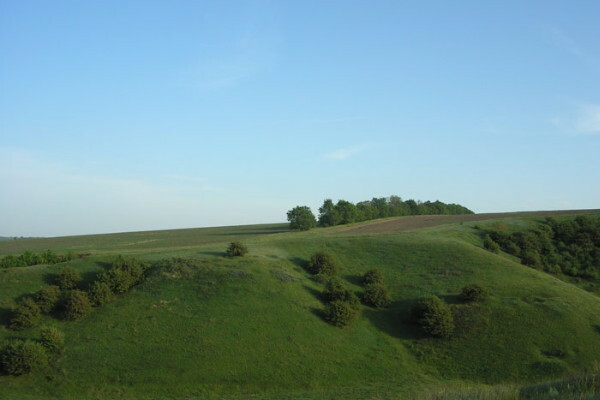 It is an undulating plain that descends to the Dnieper River from an elevation of 170–200 m in the northeast to 60–100 m in the southwest. Its major rivers include the Dnieper River and its tributaries, the Psol River, the Sula River, and the Vorskla River. Its soils are mainly chornozem, although near the Dnieper River podzolized chornozem as well as solonchak soils and solonetzic soils can be found. The region's natural steppe flora has largely disappeared and been supplanted by cultivation. Its forests are mainly oak, but also contain stands of ash, maple, elm, and hornbeam. On the sandy terraces formed by rivers there are also pine, birch, and alder. The climate is continental, with average January temperatures of –5.5̊C to –7.5̊C and July temperatures of 20.9̊C to 21.7̊C. The average annual precipitation is 430–560 mm, and the average growing season is 168 days. The region has deposits of iron ore (in the Kremenchuk Iron-ore Region), natural gas and petroleum, peat, clay, and stone suitable for construction. There are also sources of mineral water in the Myrhorod region. History. At one time the Poltava region and Chernihiv region were the territory of the Siverianians. After the reign of Yaroslav the Wise the Poltava region became part of Pereiaslav principality, which came under the control of the Golden Horde in 1240. In 1360 Lithuania established its hegemony over the area, and then Poland (after the Union of Lublin) incorporated it into Kyiv voivodeship. Waves of attacks by Cumans and then by Tatars depopulated the region. Resettlement began in the 15th century and reached the Sula River before it halted again in the 16th century. It resumed during the Cossack period in the early 17th century, at which time it reached the Vorskla River and the Orel River. Under the Cossack Hetman state the territory was divided into Poltava regiment, Pereiaslav regiment, Myrhorod regiment, Lubny regiment, Pryluky regiment, and (partially) Kyiv regiment. After the abolition of the regimental system the region became part of Kyiv vicegerency, Chernihiv vicegerency, and Katerynoslav vicegerency and New Russia gubernia. After 1796 it was briefly in Little Russia gubernia. 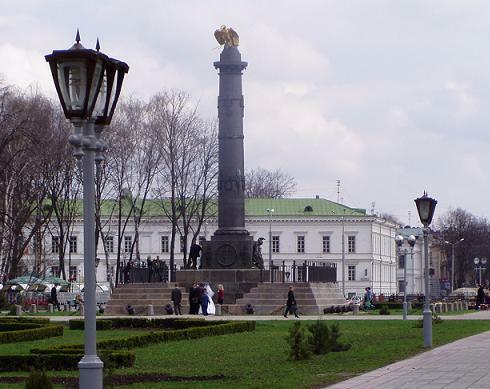 Poltava gubernia was formed in 1802, and existed until 1925. In 1914 the gubernia had 15 districts, with an area of 45,893 sq km. Throughout the 19th century and until 1914 the population of the region increased steadily, particularly after the abolition of serfdom. In 1851 it stood at 1,669,000; by 1897 it had reached 2,778,000, an increase of 67 percent; and in 1914, it was 3,790,000 (36.5 percent higher than the previous level and more than double the 1851 figure). Its natural growth rate was one of the highest in Ukraine and in the Russian Empire. In 1887–97 it stood as 18.8 per 1,000 inhabitants (48.3 births and 29.5 deaths). At the same time migration out of the region was more substantial than in any other Ukrainian gubernia; it proceeded at about a third of the rate of natural growth. It was prompted mainly by severe rural overpopulation and a lack of industry. Initially most emigrants headed for Southern Ukraine and the Kuban, then, to eastern Transcaucasia, and from the late 19th century, beyond the Urals to Siberia and the Far East. By 1897 an estimated 443,000 people (representing approximately 16 percent of the region's remaining population) had left. In 1897–1914 over 360,000 more people left (about 22 percent of all emigrants from the nine Ukrainian gubernias). Another 100,000 to 200,000 Poltavians worked seasonally outside the region as agricultural laborers or as miners in the Donbas. The names of certain settlements in Subcaucasia and Asia (Poltava, Poltavka, Novopoltava) bear witness to the presence there of Ukrainians from the Poltava region. 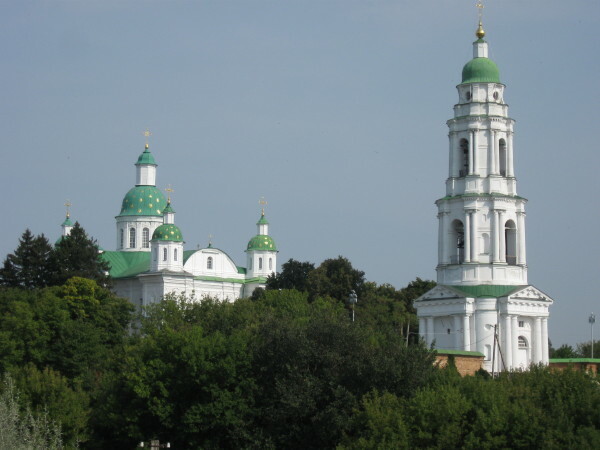 In 1897 approximately 90 percent of the population of the Poltava region was rural. The largest cities were Kremenchuk (pop 58,600), Poltava (the gubernial center, 53,000), Romny (22,500), and Pryluky (19,100). The district towns included Hadiach, Lubny, Myrhorod, Pereiaslav, Pyriatyn, and Zolotonosha. The region had the highest proportion (93 percent) of Ukrainians of all Ukrainian territories. The minority groups included Jews (4 percent, mainly in Kremenchuk and Poltava), Russians (2.6 percent, mainly in the cities and some towns of Kostiantynohrad county), and Germans (0.2 percent). In all of the cities except Kremenchuk Ukrainians constituted a majority of the population. Three-quarters of the gross domestic product of the region was tied to agriculture, and it supported 90 percent of the population. After the abolition of serfdom peasants owned 50 percent of the land, and landowners controlled 47 percent. Although peasants gradually bought up most of the arable land, population growth offset their gains. In 1877 the average size of a private holding was 10.9 desiatins; in 1905 it was 9.6. In 1910 there were 450,000 agricultural households in the region, of which 23,900 were landless and 189,200 had very little land (less than 3 desiatins). It is estimated that on the eve of the First World War 47.3 percent of households in the Poltava region could not subsist on the revenues and produce generated by the land they controlled. Agricultural methods in the region were outdated (most farmers used the three-field system). Seventy-five percent of the territory's area was under cultivation. Peasants plowed 75 percent of their holdings, and the larger landowners plowed 57 percent of theirs. Grains were the dominant crop, although tobacco was also raised extensively (the Poltava region and Chernihiv region being major tobacco producers in the Russian Empire in the 19th century). In 1913, 27.1 percent of the land was used for growing spring wheat, 25.8 percent for rye, 13.7 percent for barley, 13.4 percent for oats, 5.3 percent for winter wheat, 3.1 percent for millet, 3 percent for potatoes, 1.1 percent for hemp, 1.1 percent for sugar beets, and 0.5 percent for flax. The average grain yield per harvest in 1883–1900 was 7–8 centners per ha. Through the efforts of zemstvos in introducing new methods, yields increased steadily, and by 1913 they ranged from 10.7 to 12.7 centners per ha. Zemstvos also set up breeding stations for the improvement of livestock strains (particularly cattle). Peasant livestock, however, was both quantitatively (in 1913 there were 14 horses, 22 cattle, 20 sheep, and 13 pigs per 100 inhabitants) and qualitatively deficient. Nevertheless the region enjoyed a large agricultural surplus (about 25 percent of its grain production, less for livestock). Local industry was geared primarily to the refining of raw materials to satisfy the needs of the local population. Enterprises were small and employed a total of about 40,000 people (1913). Eighty-five percent of industrial production of the area was connected with foods (flour milling, various oils, distilling, brewing, sugar refining, etc). Kremenchuk and Poltava were the principal centers. 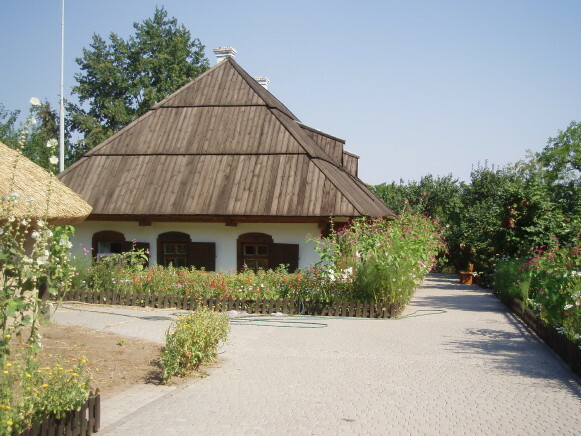 Local crafts were highly developed (about 6,000 establishments) and included pottery (in Opishnia), basket weaving, carpet weaving and kilim weaving, embroidery (Reshetylivka, Dihtiari), tanning, and woodworking. 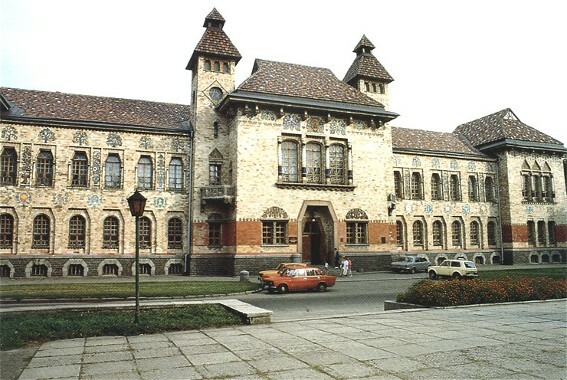 Zemstvo administrations encouraged the development of such craftsmanship through special schools, courses, and workshops and the work of itinerant instructors. In 1913, zemstvos spent 419,000 rubles on such a program in the Poltava region (49.7 percent of the total zemstvo expenditures in the field for the nine Ukrainian gubernias). The Poltava region played an important role in the history of the Ukrainian people in the 19th and early 20th centuries. From 1825 it took the lead in Ukrainian civic affairs away from the Chernihiv region, which had been the culturally and politically dominant region of the Hetman state in the 18th and early 19th centuries. Several factors played a role in the change. The geography of the region made it particularly suitable for agricultural development. The colonization of Southern Ukraine, the growth of trade routes to the Black Sea and Sea of Azov, and the shift of marketplaces southward in the early 19th century accelerated the region's rise to economic pre-eminence. The economic security and estate privileges enjoyed by the larger landowners and the presence of a number of Cossack starshyna families afforded them the independence to preserve Ukrainian traditions in ideology and everyday life and to preserve the Ukrainian character of the people who lived on their estates. 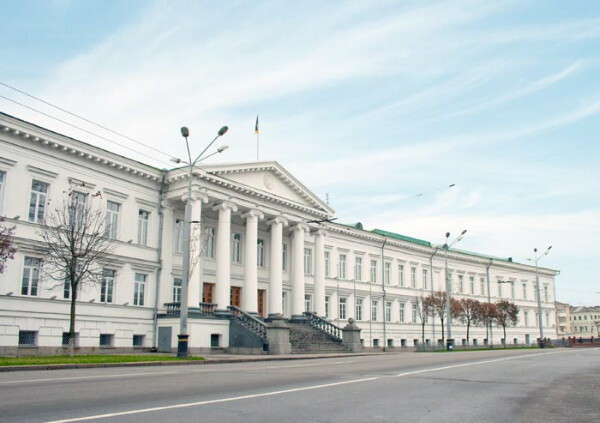 The fact that the headquarters of the Russian imperial administration for Left-Bank Ukraine (the Little Russian general governorship) was in Poltava from 1800 until the 1830s also came into play. Some of its leading officials, including Princes A. Kurakin and Nikolai Repnin, were sympathetic to Ukrainians and assisted the local gentry in furthering their careers and in securing local social and political influence. The leading Ukrainian noblemen of the imperial establishment either had landholdings or served as administrators in the Poltava region. Their position helped to cushion the region from the anti-Ukrainian campaign waged by the imperial authorities in the late 19th century. In addition to Poltava itself the regional cultural and political centers included cities such as Hadiach, Lubny, Myrhorod, and Pryluky as well as the estates of nobles in Kybyntsi (Dmytro Troshchynsky), Obukhivka (Vasyl Kapnist and his heirs), Khomutets (Muravev-Apostol family), Yahotyn (Repnin family, formerly of the Rozumovsky family), Trostianets (Skoropadsky family), Sokyryntsi (Galagan family), and Kachanivka (Tarnovsky family). The society of these families proved to be receptive to the ideas of Taras Shevchenko and the Cyril and Methodius Brotherhood. It also helped to establish the Ukrainophile nature of the region's zemstvo administration, which until 1917 was perhaps the most nationally conscious and active body in community and cultural life in central and eastern Ukraine. Many notable 19th- and 20th-century Ukrainian cultural and political figures were born or were active in the Poltava region. They include the scholars Dmytro Bantysh-Kamensky, Pavlo Chubynsky, Mykhailo Drahomanov, Vasyl Horlenko, Volodymyr Lesevych, Ivan Luchytsky, Mykola O. Makarenko, Mykhailo Maksymovych, Mykola Markevych, Matvii Nomys, Mykhailo Ostrohradsky, Ivan F. Pavlovsky (who focused much of his work on the Poltava region in particular), Oleksander Potebnia, Volodymyr Shchepotiev, Yakiv Shulhyn, Mykola V. Storozhenko, and Mykhailo Tuhan-Baranovsky; the writers Borys Antonenko-Davydovych, Pavlo Biletsky-Nosenko, Mykhailo Drai-Khmara, Nikolai Gogol, Leonid Hlibov, Vasyl Hohol-Yanovsky, Yevhen Hrebinka, Vasyl Kapnist, Vladimir Korolenko, Ivan Kotliarevsky, Lesia Ukrainka, Amvrosii Metlynsky, Panas Myrny, Olena Pchilka, Volodymyr Samiilenko, Mykhailo Starytsky, Oleksa Storozhenko, Arkhyp Teslenko, Ostap Vyshnia, and Liubov Yanovska; the composer Mykola Lysenko; the painter Volodymyr Borovykovsky; the kobza players Opanas Slastion and Ostap Veresai; the religious activists Parfenii Levytsky and Oleksander Yareshchenko; and the political activists Opanas Markovych, Borys Martos, Mykola Mikhnovsky, Symon Petliura, Mykola Porsh, and Oleksander Shlikhter. After the Revolution of 1917 the Poltava region was vitally important to the new Ukrainian state during the struggle for independence (1917–20). Many of the state's governmental leaders (Andrii Livytsky, Borys Martos, Symon Petliura, Mykola Porsh) were born there and became active there. In 1917 the Ukrainian Democratic Agrarian party was formed in the region. Other local political activists of the period included Viacheslav Lypynsky, Mykola Mikhnovsky, Serhii Shemet, and Volodymyr Shemet. After the transition to centralized Soviet rule the Poltava region no longer played the special role it had held in Ukrainian affairs. In 1925, upon the abolition of the gubernias, the region was divided into five okruhas (Poltava, Kremenchuk, Lubny, Pryluky, and Romny). In 1932 it was divided between Kyiv oblast and Kharkiv oblast. In 1937 Poltava oblast was established, and divided into 25 raions. It incorporated approximately 62 percent of the area of the former Poltava gubernia.